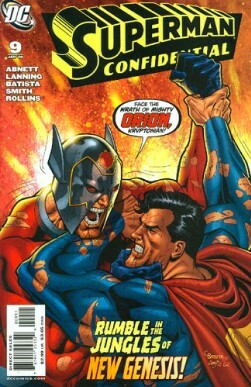 Superman responds to Orion's challenge with dissent, and they do battle before Orion booms Superman to New Genesis. Superman bats Orion away and flees, discovering a nation preparing for war. Lightray pursues Superman, who flees to space and sees Apokolips. Orion chases Superman, Superman bats him away and flees, seeking a place to hide. Inside the city, Metron electrocutes him and takes him captive. Highfather scoffs at Superman for his size and familiarity to humans. Superman scoffs at Highfather for pretending not to be at war. Highfather shows Superman that Metropolis is in danger through the scrying pools, and Superman demands to go back. Superman finds out about Apokolips and New Genesis. Superman finds out that Metropolis is under attack and demands to go back. Or, more specifically, two thematic beats. Superman finds out about New Genesis and Apokolips. Superman is brought before Highfather and asked to help. Superman reiterates what we already know, that he's about to fight Orion. Superman is chased by Lightray. Superman demands to go home. Notice "escapes," "fights," and "debates." This is what we would call a repeated dilemma. In writing, if you repeat a dilemma, you have to escalate the consequence or the reward. That doesn't happen here, which is why what happens looks really cool, and has fanboy moments, but at its core is essentially nothing. The age old question: "What is this about?" Well, it's about, at its very best, whether New Genesis is like the American government. And only in light allegory. Otherwise it's just a punch back and forth. From Countdown I would expect this. From DC right now I would expect this. I am absolutely crushed to see this come from two of my favorite writers, Dan and Andy, who I expect much better from. Yes, seeing Superman meet Darkseid and Highfather is cool. But yes, we've already seen this, and it does nothing to further the character. And it doesn't take three issues. Art - 5: The art, however, is still incredible, top to bottom, and channels some of the best of Kirby with most of the modern reinterpretations of these characters. Every page pops with color, action, and detail. Really good times. Cover Art - 4: Minus one for the words. And really, well and truly, whoever put a giant crappy bit of dialogue in the middle of this wonderful image needs to be shot to death with Omega Beams. Even if it's the artist. Throwback? Throw it back. Said it once, I'll say it again for words on covers.